This afternoon, I set out to photograph snowflakes. I put my reversing ring on my macro lens, and attached my 50mm 1.8 II lens for increased magnification. I even got out a piece of black posterboard. When I finally made it outside, the flakes had stopped falling. I looked around and saw that one of our perennials, a prostrate herbaceous thing thing with white bell shaped flowers like a petunia (Kylee, help! 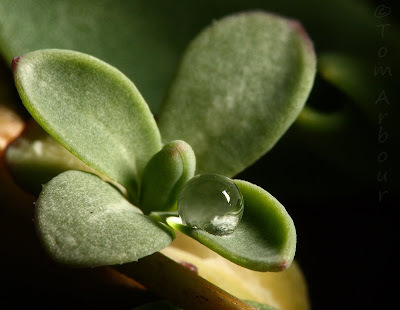 ), had water droplets beaded up on its hydrophobic leaves. What a great opportunity! I also used my Vivitar 285HV, off camera for this shot. The drop was only about a centimeter from the rear element of my reversed 50 mm lens. Tripod used as well. This shot reminds me a little bit of rain drop tipped moss spores I photographed last July. RAW file processed in Canon Digital Photo Pro, sensor dust removed with CS4. For those that are interested in shots like this, it can take quite a bit of gear. Here's all what I used. Camera settings, Manual Mode, 1/200 of a second, f/22, Flash on manual, hand held off camera with sync cord, 1/16 power. Once a week I'm going to try to do one of these "how i got the shot" posts, they're fun, and it is time for me to start passing along some of my photo knowledge that I've been accumulating for the past year and a half, since I purchased my first DSLR camera. One other thing- amid all this tech talk, be sure to compose your shots carefully, and try to put meaning into each and every capture. To me, the round drop of water reminds me a bit of our own little earth, just as it was birthed out of the center of a gigantic mother plant. Tomorrow we'll finish up our Highbanks Hike. Lots more in the pipe as well, like macros of a live cicada larvae and the gelatinous gooey seeds of native mistletoe. Tom: Wonderful shot but what a lot of eqipment. You were really prepsred. The water droplet looks like it contains another world within it. Very beautiful. Nice shot. The flash was especially well executed here. Very well-captured! I love how spherical the drop is. I've never played around with reversing lenses (and barely used the set of extension tubes I have). Superb capture & helpful info--thanks for sharing both! Well, the camera information just sort of goes over my head, but the shot is wonderful :-) That drop of water is perfect. Megan- Yes, you know that. I'm "giving back" now, kinda like "Idol Gives Back"
Thanks Tom. This shot was taken about two feet from my front door, so luckily, I had everything I needed. You're right though, I've been collecting stuff to take these type of shots for a while. Jaymez- Lots of outtakes where said flash was not so well executed, it is trial and error working in such cramped quarters, but that is what is great about digital photography. Thanks Lana- I could see you taking macros some day with your SLR! Mary, thanks so much. The hydrophobic nature of the leaves really made the drop coalesce nicely. Lovely photo! The shape of the drop is fascinating.